Already half way through the One Room Challenge with still a lot of work left to complete. Welcome to Week 3! As you may already know, I am a guest participant in the One Room Challenge this season. With this being my fourth go around, you would think I am used to the stress of the time line and would properly prepare for it…right?! As with anything, even really well planned projects have hiccups and this one is no different. A few schedule delays with getting the materials we need to complete the job is causing my some angst. But I am confident it will all turn out in the end…fingers crossed. If you missed out on the before pictures and what we have completed so far, please check out the prior weeks. And you will also want to see what the other participants have been up to HERE. This season we have some really amazing room transformations planned, the talent in this challenge is incredible! This week has been about preparing the space. We have built out the entrance area on the left and right sides of the wine cellar. This space was previously used to house smoking ventilation equipment, since the room was a “smoking room”. The black doors at the front of the entrance along with the framing on both sides of the cellar, are being ripped out. 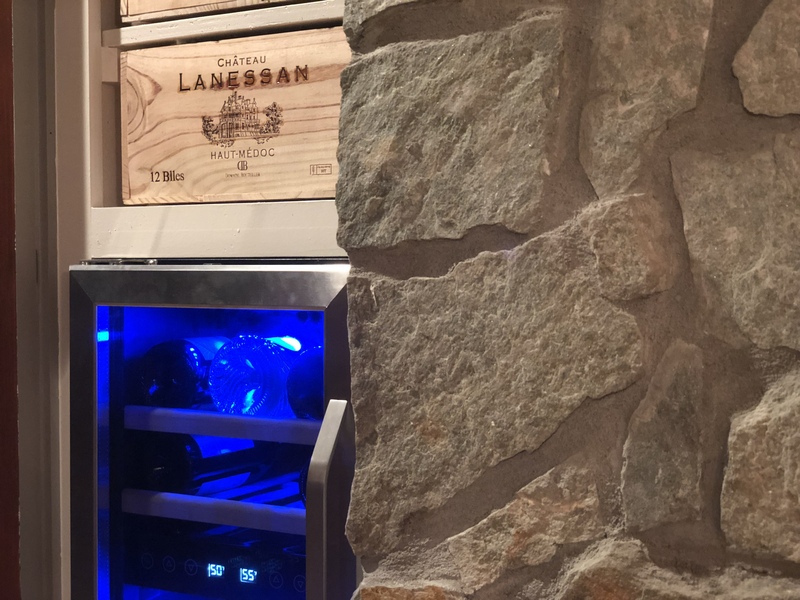 My husband came up with a great idea to utilize the space, create custom nooks to house wine refrigerators. The two areas are narrow, not big enough for full size wine fridges but half sizes would fit and look nice with exact measurements. My handyman has taken on the job or ripping out the smoking cabinets and building a space to meet our requirements. We came up with exact specifications for the space so the fridge would have a custom built in look. We also added an outlet for the fridge. The space is looking good. We created two cubes on top and two cubes on bottom of the space and painted the shelves a creamy white. We plan to store crates of wine in the spaces. We could also store glasses or other odds and end in the space as well. The wine refrigerators we bought each hold 29 bottles of wine and have a dual cooling system, so we can chill reds and whites at different temperatures. We also began electrical work by removing 6 recessed lights and two fans from the ceiling. We are also putting in a center junction box to hang a chandalier. The ceiling is almost ready to be painted, another coat of mud, a bit of sanding and we are good to go! The new lighting for the room has been ordered and arriving soon! Make sure to check back next week to see our progress. Don’t miss a post, subscribe to Happy Haute Home, and follow along on Pinterest HERE, and Twitter HERE and feel free to pin and tweet your favorite pics from Happy Haute Home. Thanks. We still have a long way to go. Waiting on some replacement pieces, fingers crossed everything comes together on time! Your wine cellar is going to look amazing! 😍 I’m also a home renovator and wondering how you become a guest on the one room challenge? Thank you, it’s been a great project, will be happy when it’s done. To be a guest, you have to register on the website, pretty easy. The next one is in April, they are twice a year. I love the accountability…the stress not so much but have found them to be really fun too. Before this season, you had to have a blog to register, now you can register with just an Instagram account. Hi Toya! Thanks, it’s fun 🙂 Just painted the baseboard, now getting ready to hang the sconces! Woop Woop!